In honor of the newly (re-elected) US president, I created this Barack-y Road Pie riff off of Rocky Road pie for election night. Or rather, "pah!" as the South would say it... Joe and I have been watching a lot of Friday Night Lights quite obsessively because it's amazing and it makes us really want to speak in charming Southern accents all the time...! 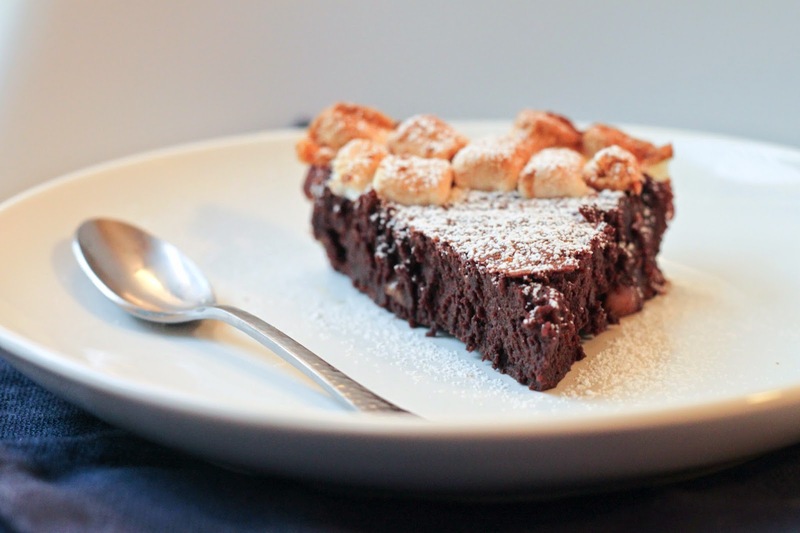 It's a simple brownie pie--I use the term "pie" loosely, since I didn't make a crust to go with it, so technically it's more like a brownie baked in a pie pan--jazzed up with walnuts and marshmallows. Now, as far as ice cream goes, I never choose anything chocolate-based, so I'd never even tasted Rocky Road ice cream till last year. When I found it in Joe's freezer, I was surprised to learn that his roommate, Ran, loves it. Surprised because Ran doesn't eat sweets and avoids anything saccharine. I thought marshmallows would deem it too sweet for him but he insisted there was "just something about Rocky Road". I'd have to agree. Marshmallows are, by themselves, very very sweet. But combined with chocolate, their sweetness is slightly muted and their texture adds something wonderful to the whole dessert. I only had a handful of mini marshmallows on hand for this pie, but next time, I'm most definitely covering the top in them. They came out perfectly browned and toasted from the oven and everyone was sneaking slices with as much marshmallows on them as possible. 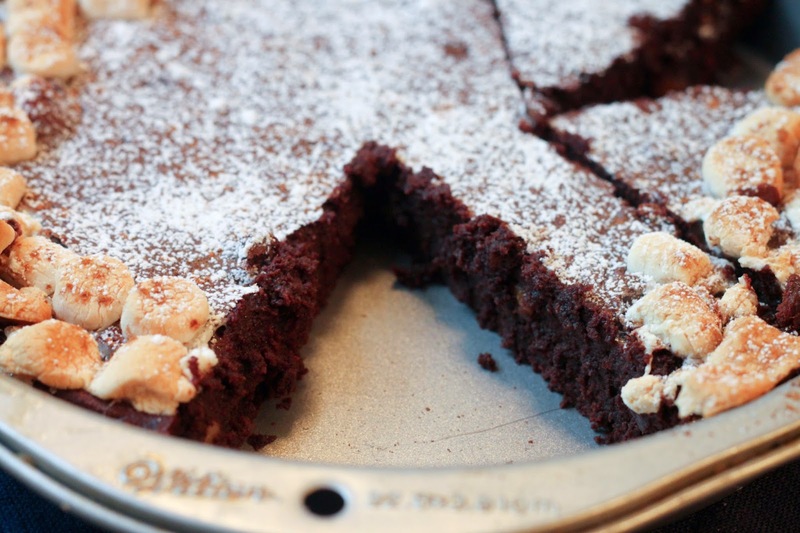 Not to be out-shined, the brownie itself is one of the best recipes I've had in a long time. It's thick and rich, very fudge-y, and practically melts in your mouth. Also interesting because I prefer more chewy cake-y brownies, but this just seriously hit the spot. 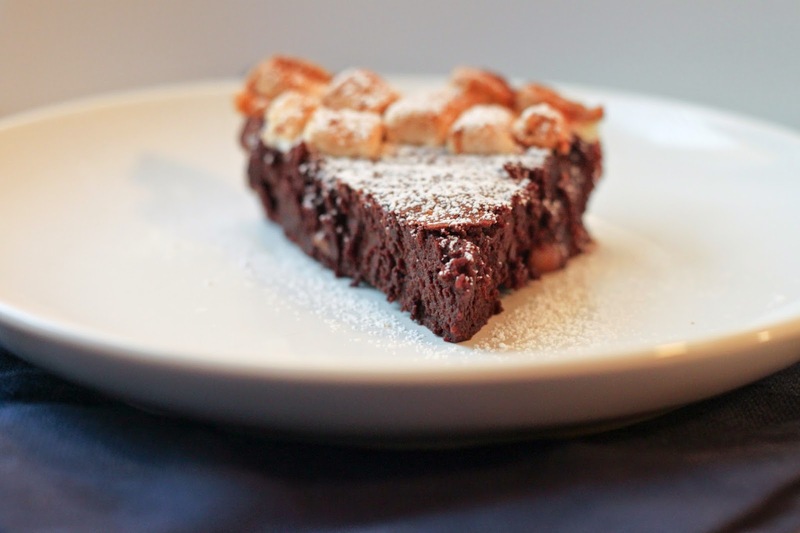 I interspersed some walnut pieces throughout to keep with the Rocky Road theme, but I've never been a huge fan of nuts in my chocolate, so I might omit next time and just call it a plain ole brownie pie. Although Rocky Road ice cream still isn't my favorite, I can definitely eat much more of this pie in one sitting than I'd like to admit. It's the best for warm, cozy nights when it's cold outside and you want to indulge in something fabulous. Melt chocolate and butter together in a saucepan over low heat. 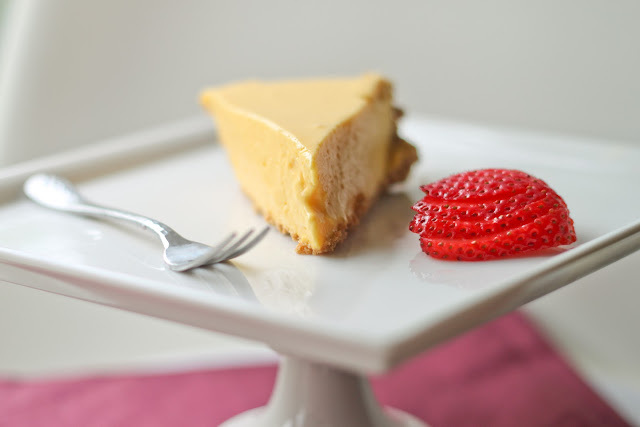 Separately, combine eggs and sugar and beat until fluffy and pale yellow (about 3 minutes). Add in the chocolate/butter mixture and beat until combined. Fold in the flour, salt, and cocoa powder. Stir in heavy cream on low, or fold it in, making sure there's no white streaks. Pour into a greased pie pan. Bake for 25 minutes or until the pie is puffed slightly and the crust is dry. Cool on a rack and eat warm or at room temperature. Lasts in an air-tight container at room temperature for about 3 days. I want some! Rocky Road is my favorite ice creme and would be a great compliment to your Barack-y Road Pie. I've seen a couple of Baracky Road named desserts going round the internet but I think this is the most delicious! Yum. What a scrumptious chocolate dessert! I just might need a slice when the marshmallows are warm and gooey straight out of the oven!